Evelyn Beatrice Kindle passed peacefully on April 23, 2018 at Lakeland Regional Medical Center while her immediate family attended her at her bedside. She lived a long and productive life filled with much love for God, her family and friends. She was a proud employee for Publix Supermarket for over 34 1/2 years. She was blessed with many gifts and talents that she unselfishly used to help others. She was a faithful member of Greater St. Paul M.B. I. Church since 1957, where she actively served until her death. She was married to her loving husband, Junnie L. Kindle of 56 years who preceded her in death in 2016. She leaves to cherish her memory two loving daughters,one step-daughter, four grandchildren, three great-grandchildren, and a host of family, friends, and neighbors. To send flowers or a remembrance gift to the family of Evelyn Beatrice Kindle, please visit our Tribute Store. 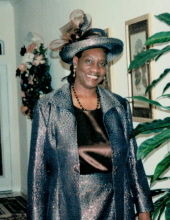 "Email Address" would like to share the life celebration of Evelyn Beatrice Kindle. Click on the "link" to go to share a favorite memory or leave a condolence message for the family.